Omar Metwally and Arian Moayed in Guards at the Taj. Photo by Doug Hamilton. BOTTOM LINE: Guards at the Taj is a staggering, uncomfortably comedic, and deceptively simple play about the profound repercussions of a job well done. If you’re tuned into any news these days you’ll know that the destruction of beauty is all around us. From natural disasters in Nepal ripping out temples hundreds of thousands of years old, or perhaps even more relevant to Guards at the Taj, ruthless extremists whipping out cultural heritage in Egypt and the Middle East, priceless things are being obliterated. The human cost is staggering and the historical value lost is unfathomable. What Rajiv Joseph’s new play Guards at the Taj shows us is the creation of such beauty. 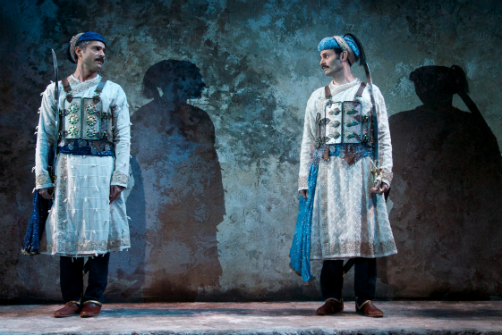 At the play’s beginning we see two men, Humayun (Omar Metwally) and Babur (Arian Moayed) standing motionless in front of giant gray stone wall. We learn they are imperial guards guarding the Taj Mahal just one day before it is unveiled to the public. Under construction for some sixteen years, the King has ordered it to be covered until it’s completion when, therefore, the most beautiful thing in the world will be revealed. It’s a glorious and simple thing to have these two men standing so far downstage and so unwavering for nearly twenty minutes of stage time. Director Amy Morton allows us to really get into these obedient minds and to also see their youthful anticipation of a thing at which they haven’t even peeked. They stand for so long you almost wonder if this is the play in its entirety. But it’s when the Taj is revealed that David Weiner’s watercolor-esque lighting paints us a beautiful golden radiance of a building we only see through Humayun and Babur’s eyes and the play takes a huge lurch forward. The wall is now opened to reveal a stone chamber, the floor bubbling with fresh blood (sets designed by Timothy R. Mackabee). Now, the boys have retreated into the corners of the room, no longer at obedient attention. What’s useful to mention at this point is that Joseph’s play is largely a comedy. Indeed, almost slapstick. In this bloody scene, as if slipping on a banana peel, one of the guards has trouble moving from one of the side of stage to the next in the puddles of blood. His sword swings about in utter hilarity and terror. 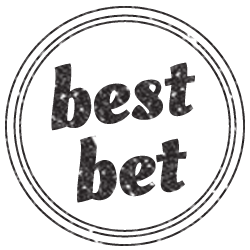 It’s a trademark of Joseph’s playwriting that he can juxtapose the horrific with the comedic, elevating both in profundity. And it’s now we see the human behind what must also be happening today. What must it be like to be an Egyptian tomb robber, digging holes in unexplored graves and tearing at priceless mummy wrappings, discarding bones for the jewelry inside? What are you doing to yourself and the beauty of the thing you leave in the desert sand?